To the casual visitor, Merced, California in the mid 1960s seemed to be like any other San Joaquin Valley town. Very hot and dustyduring the summer, and chilly and foggy during the winter, with a reliance on agriculture and nearby Castle Air Force Base for its economic foundation, there didn’t appear to be much for young people to do in this town of less than 30,000 residents. On weekends, high school sports or going to the stock car races at the Merced County Fairgrounds, as well as cruising 17th Street until the wee hours of the morning, were the activities that were most visible to people getting off Highway 99 heading to Yosemite National Park or to just stop in Merced to eat or sleep on their way to Los Angeles or San Francisco or Sacramento, or, for that matter, almost anywhere other than Merced. But, younger residents of Merced, or nearby smaller towns like Atwater, Livingston, and Chowchilla, knew that beneath Merced’s tranquil surface bubbled a vibrant music scene. On almost every weekend, dances were held at one of Merced’s four active venues, the American Legion Hall on 17th Street, the Italo-American Hall further west on 17th Street, the Women’s Clubhouse on West 23rd Street, or the Merced Fairgrounds. With so many places to perform there always seemed to be local bands forming. Most of these bands stuck to a fairly basic formula; the members of each band primarily dressed in matching clothing and played music by artists like Freddy King or Magic Sam. There was a heavy emphasis on instrumentals, and vocals were usually limited to a single band member. The most prominent band to emerge from this scene was the Merced Blue Notes who recorded an album for Ace records in the early 60s, as well as singles for several different labels. Another Merced artist, Roddy Jackson, played in several local bands before having some success recording for Specialty records (Roddy is still active and has had several European tours in recent years). Of course, all of these bands did not foresee the changes that would come with a little four piece band from England that would show up in the U.S .in late 1963, The Beatles. The first English invasion influenced band to emerge from the Merced scene was the Brogues. Deriving much of their sound from bands like the Rolling Stones and the Pretty Things, the Brogues recorded two 45s, the second of which, “ Miracle Worker” got airplay in several U.S. cities. 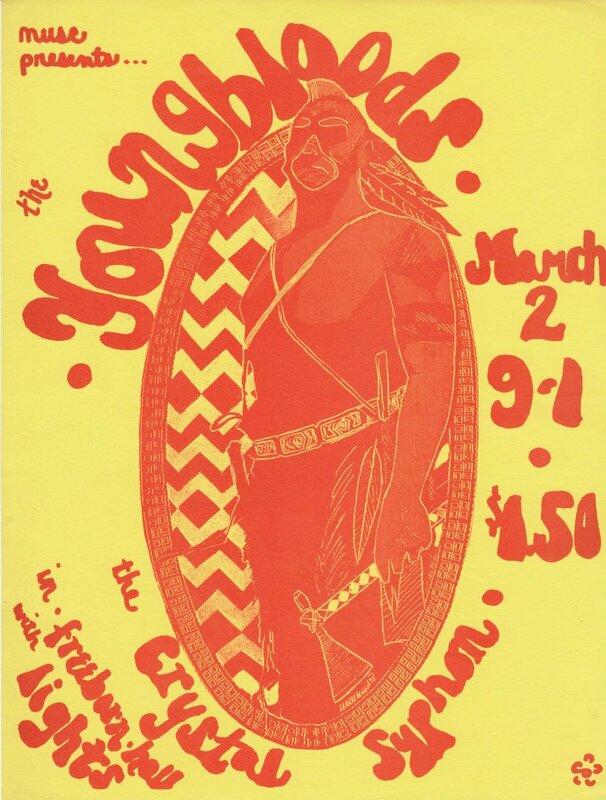 Unfortunately the band broke up after this, but two of its members, Greg Elmore and Gary Duncan, moved to the San Francisco area and became original members of the Quicksilver Messenger Service. Another Merced area resident at this time, Michael Olson, went on to considerable fame. After playing in several local bands, he changed his name to Lee Michaels, and recorded several albums, while also having great success as a touring act with his unique two piece band with just Lee on keyboards, a drummer, and a giant wall of Acoustic amplifiers. Crystal Syphon was formed in 1965 by a group of musicians from Merced High School. Originally known as the Morlochs, the founding members were Jeff Sanders on vocals and percussion, his brother, Jim Sanders, on rhythm guitar and vocals, Tom Salles on lead guitar and vocals, Dave Sprinkel on keyboards and vocals, Roger Henry on bass and Andy Daniel on drums. The band was at first very much influenced by the Beatles and such Southern California bands as the Byrds; because of the ability to sing four part harmonies, the band was able to do versions of Beatles’ songs that would be impossible for most other bands of the time. The group played the usual Merced area gigs, including several battle of the bands and dances. But under the management of Jeff and Jim’s older brother, Bob, from the very beginning the group was more ambitious than being just a Merced band and began writing original music. All money earned as a band was pooled together to pay for both equipment and recording sessions and this policy continued during the entire time the band was together. The band also began rehearsing as much as possible, often getting together six nights a week, with some practice sessions used only for vocal work or for songwriting. At the beginning of May, 1966, Roger left the band and was replaced by Bob Greenlee on bass. In early 1967, the band recorded “Marcy, Your Eyes,” “Paradise,” and “Have More of Everything,” which are included on this release. A little later that year, “Try Something Different” was recorded. Both of these recording sessions at Terzian’s studio in Fresno, CA and were 3 track recordings; thus they were essentially live with only some mild vocal or guitar overdubs. In late 1967, Andy left the band and was replaced by Bob’s brother, Marvin Greenlee on drums. About this time, the band began recording as many of their rehearsals as possible. These practice sessions resulted in “Are You Dead Yet,” “Fuzzy and Jose,”(which is based on a true story of an incident in Merced) and “In My Mind.” They were done at the band’s practice facility on M Street in downtown Merced: this was a large old grocery store that had fallen into considerable disrepair. Part of the roof had fallen through and occasionally practice had to be adjourned to clean up after pigeons flew through the building and left their greetings on equipment and band members! 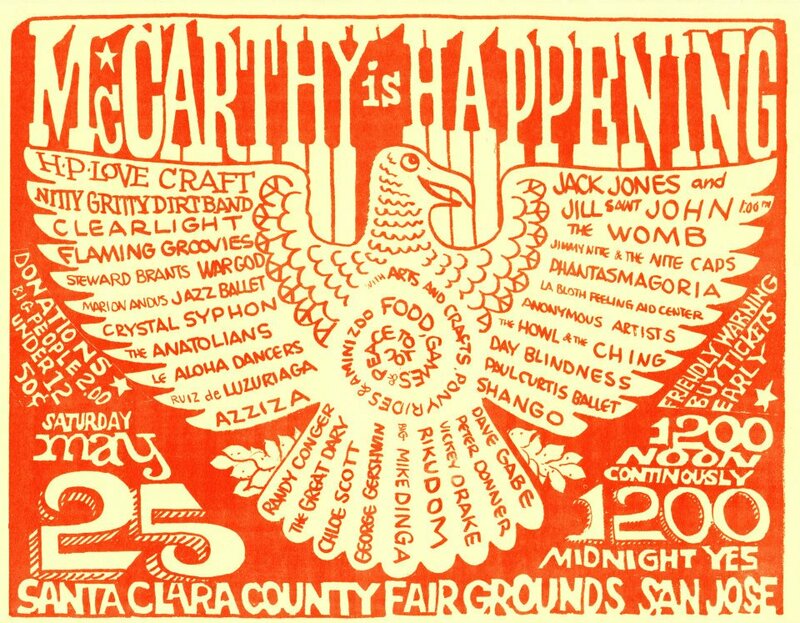 Other well known artists that the band appeared with included Bo Diddley, Creedence Clearwater Revival (both as Creedence and as their predecessor, the Golliwogs) the Youngbloods, Quicksilver Messenger Service, Country Joe and the Fish, the Grateful Dead, Buffalo Springfield, Elvin Bishop, Lee Michaels, and Santana. 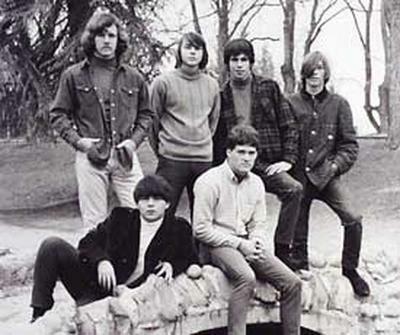 Throughout the band’s existence, the group shopped itself, with the assistance of both Bob Sanders and Richard Delong, who took over as manager after Bob left in 1967, to various record labels. The group had several offers to sign, but insisted on keeping artistic control of, and publishing rights to, the music. The group also felt it was better to stay in Merced to be able to avoid some of the temptations that musicians faced in the big city, as well as to be able to continue to develop artistically in the supportive atmosphere that Merced afforded the band. Thus, no agreement was ever reached with a label at that time. In late 1968, Jim Sanders left the band. This was followed by the departure of Dave Sprinkel in 1969. The four remaining members continued on as a four piece group with Jeff Sanders taking over on keyboards. With the departures of Dave and Jim, the band had less emphasis on vocal harmonies but tried to make up for this with more symphonic instrumental arrangements of the music, as well as more emphasis on rhythms, particularly Latin beats. The band continued on through 1969, including one final appearance at the Fillmore in late 1969, but then finally decided to call it quits in early 1970. However, the lure of music hadn’t left the guys in the group. With Marvin Greenlee moving to Stockton to play in several bands, Tom, Bob, and Jeff (now on drums) came together, with Merced guitarist John Fox, to form Boogeyman. Because the music scene had changed in Merced by this time, Boogeyman started out with the intention to be a bar band copying popular songs on the day, it did record one 45 for a local Merced label.. This record, “Old Styx River” backed by a Crystal Syphon song, “There is Light There,” (with Lucille Boyer as guest vocalist) was played locally on the radio, as well as in several East Coast cities,, but it never lead much further. Shortly after its release, John left the band and was replaced by Jimmy Shaw, a guitarist and vocalist from Los Angeles. 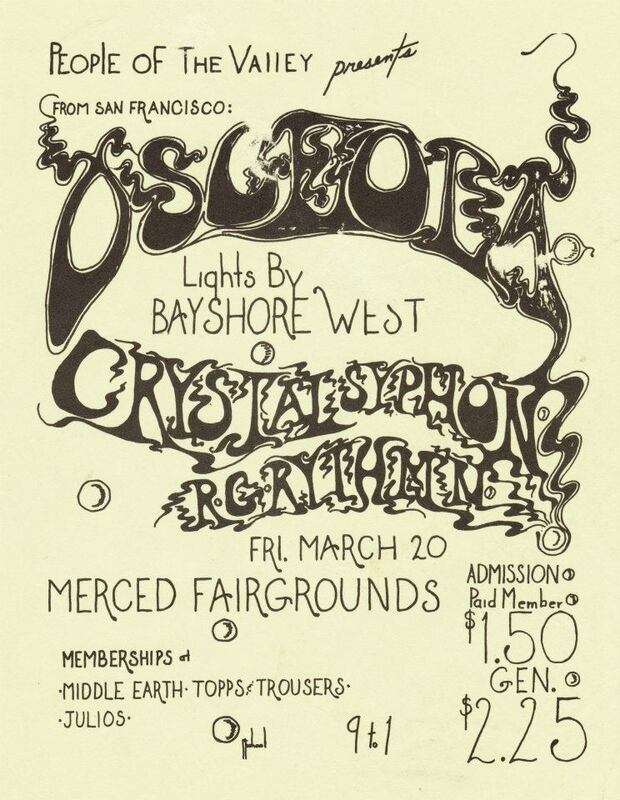 The band played several successful club gigs over the next few years, but also frequently played concerts in the Merced area; although still relying on copies of non-original material (albeit often changed and stretched to fit the band’s style) it did continue to play some Crystal Syphon songs. Bob left the band in 1973 and was replaced by Mark Blythe on bass; it continued playing for a year or so after this, until finally fading away. 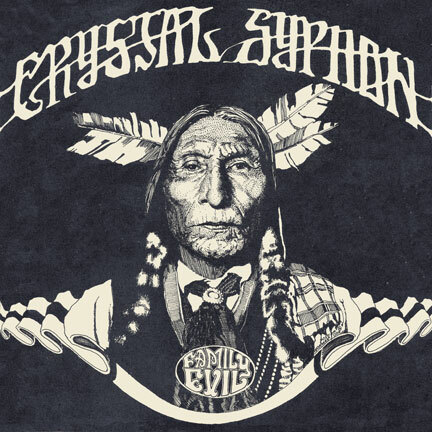 So here, after about 40 years, is some of the music of Crystal Syphon. Although a product of its time, it’s also not quite like any other music of the period. It is an amalgam of the talents and tastes of six musicians, friends, and brothers (in some cases literally, but always figuratively), from the little town of Merced California. These recordings were all made from the original tapes and were re mixed as much as possible by Jeff Sanders. Tom Salles originally played a Fender Jazzmaster guitar that was replaced by a rare Martin f-hole electric with a Bigsby tremolo by the time of the session that produced “Marcy, Your Eyes.’ On the later recordings, he was playing a Gibson SG standard. Jim played a Gibson ES-335 and Bob played a mid-‘60s Hofner Beatle bass with the staple pick-ups. Dave played a Vox Continental organ. All instruments were played through Vox Super Beatle amplifiers (Crystal Syphon was one of the first bands in the country to exclusively use these amps.) Tom’s distortion sounds heard on these records was done through the Super Beatle’s fuzz circuit. On the home recordings, Shure SM-57 and SM 58 microphones were used. Late 60’s: I was (and am) so lucky to be able to play guitar and sing for folks. I had a revelation at this show. I was glued to the lip of the stage studying everything each band member was doing. The guitarist and the song choices were a really interesting mix of melodic and harmonic ideas. The other band was the Downfold Foundation and I knew some of the players. They were WAY more danceable. I had a great time dancing with a cute girl while they were playing but I was more interested musically with what Crystal Siphon was doing. That was a great time to be hearing all these new ideas.